Yealm. – Dirty wet dog , boats and sailing. At long last, the weird bloke that writes about boats……actually went sailing again ! I thought when i started writing up the post that i would just call it ‘East’ and wonder how many would look at the title photograph and think that i had arrived in Holland , except that the land is too high. Its been 8 weeks since i have been aboard the boat let alone been sailing so with a whole bunch of days off together and with feeling as though i have got nearly a full range of movement in my back that i would just go out on a short cruise out and back. My initial plan was to do something i have wanted to do for a while ie beach and land the boat behind Burgh Island and then go up into Salcombe. That didn’t happen for 2 reasons : first that when i got outside Plymouth breakwater there was still a lumpy sea left over from a couple of windy days and with the wind set to go into the north-west it would be a long hard dead to windward slog to get back to Plymouth and once again up the Tamar. Instead of the slightly longer trip out i bugged-out halfway across Wembury bay and slipped around the end of the sand bar into the Yealm estuary and anchored off the beach at Cellar bay. Its a really popular spot especially on a summer weekend and i was surprised by how few boats there were there when i got there, although i was quite early in the day and lots more boats arrived during the day. Its a small anchorage and it can be a bit fraught there when too many boats anchor too close to each other and start swinging, today though most people got it mainly right except for the one boat that positioned himself right over my anchor. It can be a bit lumpy in the anchorage when the bar is covered and its blowing in from the west but with a very low spring ebb the bar was almost dry so the anchorage was nicely sheltered until a couple of hours into the flood. Today it was such a low spring ebb that some boaters anchored just in the lee of the bar and then swam out and walked along it in a couple of feet of water. Its a great place for the small boats that can get close-in to the beach and it seems very much the place to take the kids for a swim….this big kid had forgotten his cossy so didn’t get a swim . On my own i swim ‘au naturel’ but there were too many people around for that unfortunately. We did get a very posh visitor : this big Fife out of Plymouth who didn’t stay anchored for very long but headed further up the river. When things got a bit too lumpy out in the anchorage i motored up the river with a plan of anchoring for the night near the head of the river or at least as far as i could reasonably go and still float at low water. Just as well that i picked up a mooring lower down as the very pleasant harbourmaster came along to move the big Dutch yacht that had squeezed onto the mooring ahead of me and advised me that the mooring i had picked up i could stay on if i wanted to but no anchoring is allowed in the river !. My recent experiences with harbourmasters further west hadn’t been great but the HM in the Yealm was friendliness and helpfulness personified . Rather than coming alongside just to collect the harbour dues he first wanted to know all about my little boat and then proceeded to tell me everything i needed to know about the river. It is a very apealing little place even though i suspect it costs an arm and a leg to live there. Its also a very busy and tight river on a sunday afternoon with local yachts in and out and some bigger visiting yachts too but i was right in the busiest spot just off the sailing club and there are much quieter spots upstream. 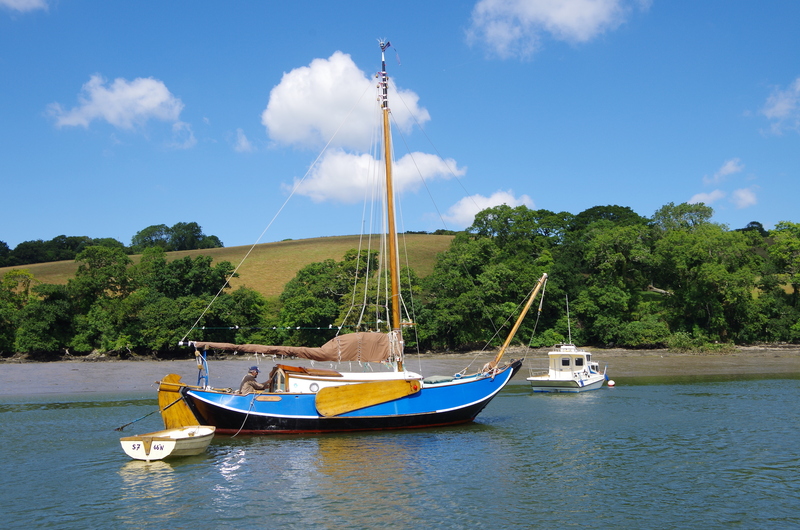 Part of my excuse for visiting the Yealm, aside from it being the first river east of Plymouth is that its the home of a strong Devon Yawl fleet and i hoped they might be out sailing, unfortunately not but it was an opportunity to see them at close hand. They are good looking little boats i must say and right now i am leaning heavily in that direction…..actually i’ve been beating all day so I am just leaning heavily !. The standard set-up seems to be that they unship both booms and the rudder and have a cover over the boat : i suspect that means that they aren’t self-draining which isn’t a great problem but that they could otherwise get a lot of rain in them without a cover. I did actually spend the night on the mooring i had picked up and only moved off in the morning to go further upstream and wait out most of the ebb. My tidal problem was that the ebb would be sluicing strongly out of Plymouth and with a brisk north-westerly would make it extremely difficult to do a dead-beat over the big spring ebb. Waiting until the last 2 hours of the ebb in the Yealm meant that i would be able to beat up into the sound on the new flood…it would still be dead to windward all the way home but not up-tide too. The Liberty just isn’t a great upwind boat over a short chop so i had to use every advantage i could , as it happens it took me exactly 4 hrs from dropping my mooring high in the Yealm to anchoring in Sandacre bay and that was after dodging 2 warships and their guard boats, the chain ferry’s at Saltash and a hard short-tacking beat up the Hamoaze. I was really glad to get the hook down in Sandacre bay and even more glad that i didn’t have another 4 hours of windward work to do as i would have had i come back from Salcombe. As a first trip out since injuring my back it was a success, just far enough to give me each element of sailing : from the Tamar to the open sea and back into another river and then to give me a fully powered up solid beat all the way home where i had to win every mile. Aside from that it was my first chance to do the boat’s housework : the deck GRP gets dirty very quickly and i don’t like leaving boats closed up for that long. Apart from some moldy cheese that i had left in the larder crate and some mildew in the heads compartment the Liberty was absolutely fine and dandy. Video of the trip from the Hamoaze to the Yealm. Previous Call that a knife ! Good to see you oot and aboot again, as the locals here say. Yes, great to see you well enough to get out on the water — lots of useful local information and the HM is a top man by the sounds of it.